Driving out in a most unexpected way. As of two hours ago, we hadn’t even thought of doing an overnight trip that weekend. Not even once. Far from it. We were in the library, studying, with our heads in books twice the size of our head. Then suddenly, we were on the road. A lot happened in between, from procrastination, to a river float, to the trip growing in numbers, but what was most important was that we were heading somewhere, taking the weekend off. Sleeping Bear Dunes, should’ve been only 4 hours away except for that wrong turn that added an hour and a half to our journey. We thought about pulling over and taking a rest, only to continue on early in the morning. But without saying anything, all three of us knew that wouldn’t be an option. No, not in a million years would we pull over and give up the chance to sleep in a tent with the sound of a Great Lake shoreline in the distance. We’d have to be foolish. So… we kept going, long into the night until finally we arrived at our site in Glen Arbor at 1:45 am. With a simple flashlight and six hands, we had the tent up almost immediately and laid down. "Failing to prepare is preparing to fail. "That’s what my coach back in high school used to say. I took it to heart, and it drives me in almost everything I do. Except that day. Too spontaneous in our decision making, we packed light and left everything behind but the clothes on our back, a bathing suit, and the tent. And let me tell you, that night we were cold. Shaking into the night because of the drop in temperature by the monstrous lakes, we only were able to close our eyes for so long. But then again, we were too excited. Excited to explore a place two of us had never been before. So sleep came, maybe not in full numbers, but the sheer excitement of the next day put us in a slumber long enough to get through the night. There’s something special about waking up in a setting you’ve never seen before, the morning sun greets you enthusiastically. Getting in so late, meant we had no idea what our surroundings looked like. Hell, we didn’t even really know where we pitched the tent until the morning. As we woke and one by one left the tent, we saw the sun breaking through the trees and the wind shaking leaves like maracas. Quickly, we packed up the tent and the few belongings we had and got in the car. With no real plan in mind, we decided to head to the shoreline. Beauty. Absolute blue beauty. I’d never seen a Great Lake before and I will never forget that first time. Having grown up by the ocean my entire life, I was used to something completely different. It was just as sandy, windy, and sunny, but something was different. The Great Lakes are one of the most impressive sites to see in the world. “Great” doesn’t do them justice, as these lakes look like oceans with horizons being even more crystal clear, blue water. As we came to terms with the beauty we would be dealing with that day, we decided to first stop in a little local diner covered head to toe in college pennants. Nice people, a dark diner coffee, and a bathroom break later we were driving to our hike for the day: The Sand Dunes. 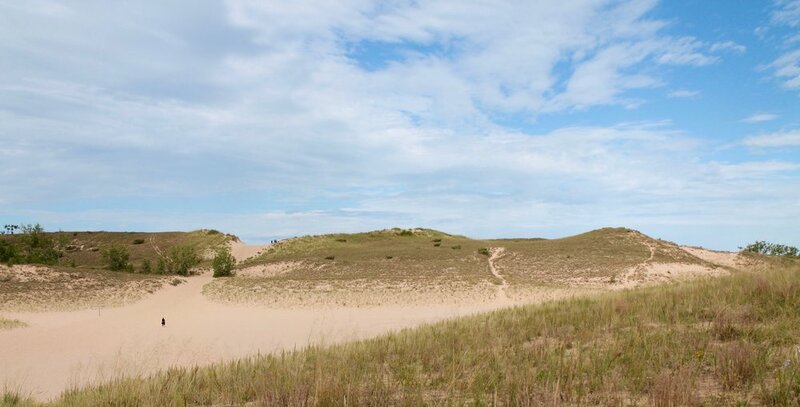 The trail was only 2 miles but it was far more strenuous than it sounded, as it required going up and down monumental, beautiful pure sand dunes until you came down into the shoreline of Lake Michigan. The hike involved plenty of tough uphills but was balanced out by the downhills, a chance to sprint full speed downhill for 150 ft. When we finally made it to the water's edge, we were all sweating, burning under the gorgeous clear sun. We walked north along the shoreline, passing by fellow adventurers making the most of the sunny day's weather with a dip in the 22,394 square mile Lake Michigan. Then it was our turn to join in on the fun. Go HERE. Quite that simple of a tip. One of the most unique places I've ever been. It was easy for an overnight. I plan on going back for an extended trip and continuing onward through the UP (Upper Peninsula) this summer season. If you find yourself in the Midwest, make your way to Sleeping Bear Dunes.